The Peruvian government has come under fire for rejecting a $2m (£1.4m) donation from Germany to build a museum for victims of Peru's civil conflict. The government in Lima initially failed to respond to the offer, saying the money would be better spent tackling poverty and hunger. But the decision has been criticised by human rights groups and intellectuals. Some 70,000 people died in the conflict between the military and Maoist rebels in the 1980s and 1990s. Peruvian Defence Minister Antero Flores has said a museum to remember victims of the conflict would be of no use to anybody. Instead he said that tackling hunger and providing medical services were greater priorities. Those comments have further fuelled criticism of the government. "This rejection is not just an unfriendly gesture toward the donors but it shows contempt for the memory of the victims and the reparations for the survivors," said Salomon Lerner, who headed Peru's Truth and Reconciliation Commission. When the news of the rejection was first leaked, the government refused to comment. Now it has changed tack. Prime Minister Yehude Simon has suggested the money go towards reparations for the victims not a museum. But it may be too late to stem the criticism, as several artists, including Peru's most famous author, Mario Vargas Llosa, have reportedly started a petition against the government's position. 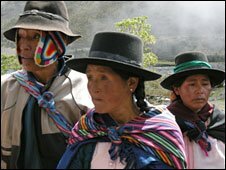 The country's Truth and Reconciliation Commission found that Peruvian armed forces were responsible for almost half of the deaths and disappearances during the conflict between Shining Path militants, rebels of the Tupac Amaru movement and the military. Peru is still in a process of reconciliation. It continues to be divided. And the German donation has opened old wounds between those who want to remember and those who would rather forget.